Every Brazilian has a deep connection with their Havaianas. We have several pairs throughout life, and we wear them everywhere – to the beach, to class, to the grocery store, and even to work now that they make fancier more stylish pairs. Because they are harder to find, more expensive and don’t have as many different varieties here in the US where I live now, I scoop a few pairs every time I go back to visit my family, or when family comes they usually bring me a pair or two (especially my aunt Maristela, she loves giving me Havaianas as a gift!). 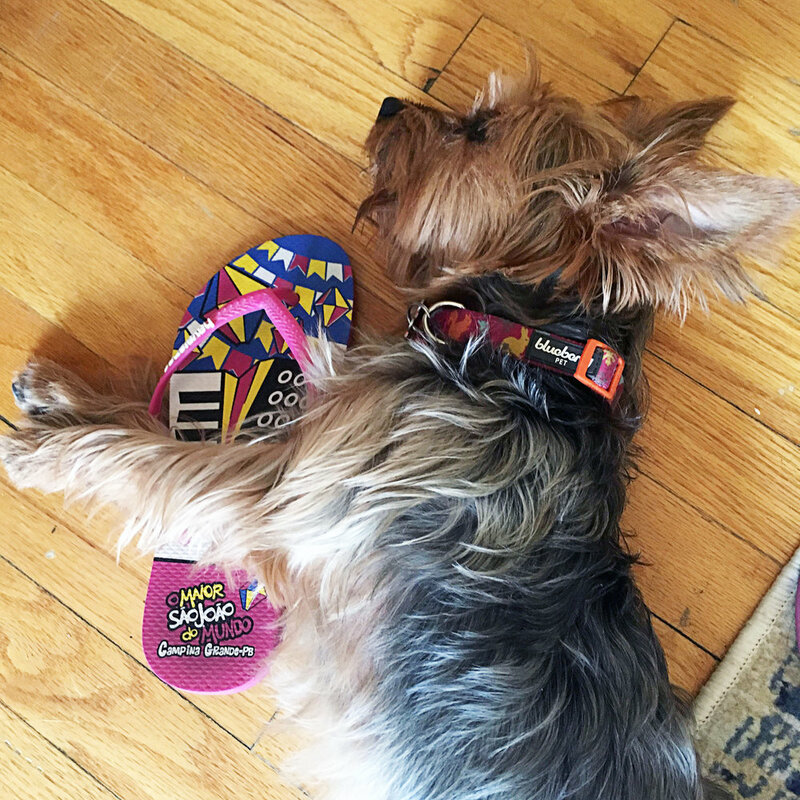 A few years ago I adopted Archer, my best friend and puppy, and he also had a deep connection with my Havaianas. He chewed a total of 6 pairs to pieces! Luckily he’s a big boy now and grew out of this bad habit, so I don’t have to keep buying more of them. This particular pair has a special place in my heart. I bought it the last time I was in Brazil, at the biggest São João party in the world in Campina Grande (a traditional music, food, and cultural celebration that happens every June). I was wearing these other shoes that would be completely destroyed in the rain that was coming, so I bought the Havaianas and kept my other shoes in the car. It was my mom’s 60th birthday, I was there with my family and my ex-boyfriend, whom I loved dearly at the time (and also bought himself a pair of Havaianas for the same reason I did). We danced all night in the rain, ate a ton of amazing Brazilian food and made some happy memories as a family.